WESTFORD, MA. February 14, 2017 –– Tyco Security Products, part of Johnson Controls, introduces the iSTAR Ultra Video, a palm-sized solution that delivers integrated, small site security scaled for enterprise management and performance. Using C•CURE 9000 Security and Event Management software from Software House or American Dynamics’ victor Unified client, iSTAR Ultra Video brings access control and video recording to the edge, allowing users to remotely control up to eight doors and eight IP video cameras using a single appliance, without the need for server software at each site. The cost-effective iSTAR Ultra Video combines access control and video surveillance functionality in a single appliance, reducing installation and infrastructure costs by eliminating the need for separate devices and network connections. With scalability to thousands of sites, it is ideal for enterprise environments with unmanned sites that require a high level of security, such as power sub stations, data centers, server farms, fiber huts and other utility and telecommunication sites. AES 256-bit FIPS 140-2 network encryption with custom key management and DoS protection help avert potential network threats. Up to 500,000 cardholders can be managed in the device’s local memory. 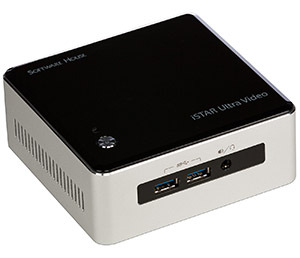 Using a 1TB on-device storage drive for video surveillance and a separate solid state drive for its local database for access control storage, iSTAR Ultra Video remains operational even when the network is down, capable of making access decisions and recording video until network connectivity is restored. Each iSTAR Ultra Video device includes American Dynamics’ VideoEdge Network Video Recorder firmware that enables end users to use transcoding, Smart Search and other VideoEdge features. Up to 6 TB of external storage can be added to the device, providing extensive local recording capacity. End users can monitor video surveillance and access control events, manage personnel, create reports, display dynamic views, and monitor system activity from a PC or by using C•CURE 9000 or victor Unified full clients, a web client or mobile app. iSTAR Ultra Video provides access control through IP-ACM Ethernet door modules, which feature AES-256 encryption, PoE and a configurable offline mode. iSTAR Ultra Video can be used in both LAN and WAN environments, and offers secure connectivity over a public network using fully secured gateway software that also enables cloud connectivity. Software House security and event management systems from Tyco Security Products are now part of Johnson Controls, a global diversified technology and multi industrial leader serving a wide range of customers in more than 150 countries. Software House’s innovative C•CURE software portfolio combines with a suite of reliable controllers to provide the most powerful security and event management in the industry. Add an unsurpassed integration platform that allows customers to integrate seamlessly with critical business applications, and it’s easy to see why Software House solutions are ideal for security-critical applications. For more information about Software House products, visit www.swhouse.com. American Dynamics video technologies from Tyco Security Products are now part of Johnson Controls, a global diversified technology and multi industrial leader serving a wide range of customers in more than 150 countries. American Dynamics continuously advances video technology via its IP solutions, while leaving no customer behind – ensuring backwards compatibility at every step. The American Dynamics portfolio features everything required for a complete, state of the art video surveillance system including a powerful enterprise analytics platform. American Dynamics solutions work seamlessly with Tyco Security Products access control products, as well as with other important business applications, to provide customers with greater ease of operation and faster access to the information they need in critical situations. To learn more about American Dynamics solutions, visit www.americandynamics.net.